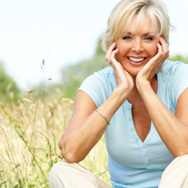 As many women can attest, mid-life changes can bring on unwanted changes, to your body as well as to your skin. Your skin may appear thinner and look less firm, and your skin type might seem to change overnight (including the onset of oily skin, redness, and bumps). If you’re unsure about how to address these changes to your skin, we can help ease your frustration with tips that will cool your senses and help your skin bounce back beautifully. That’s why it’s so important to pay attention to your skin’s specific needs, as opposed to buying products based on your age, which is what some salespeople may try to convince you to do. If you notice that your skin has become more oily or more prone to bumps and clogged pores, you need to lighten your skincare load. Instead of using creamy emollient products, try using light sheer lotions, gels, or serums and stay away from the thick stuff (except around the eyes, of course, where the skin tends to be more dry). Layering such products over areas that might need more moisture can be the balance your skin needs to become and remain bump-free but not dried out. If, on the other hand, your skin has become dry, consider more emollient products, but don’t take that to mean greasy or heavy, because that might make the skin tone look uneven and dull, more wrinkled, and appear to have a noticeable loss of firmness. Products enriched with skin-restoring and skin-replenishing ingredients and non-fragrant, fast-absorbing plant oils will bring a youthful energy to your skin, helping it regain a radiant, luminous glow. If your skin has become normal to oily, check out our RESIST Essential Kit for Normal to Oily Skin. Each step gives your skin exactly what it needs to look younger now and over the long term. Aside from this kit’s anti-aging benefits, it also diminishes the appearance of enlarged pores, tempers oily shine, and intensely hydrates skin with weightless but still-hydrating moisture. If your skin has become drier, our RESIST Anti-Aging Essential Kit for Normal to Dry Skin has exceptional directed solutions for superior hydration, increased suppleness, a more even skin tone, and transforming anti-aging results. Next, consider targeted solutions to help improve the appearance of more specific skin concerns, which may include those described below. Opt for a multitasking formula like our RESIST Pure Radiance Skin Brightening Treatment, which refines skin tone for a radiant, youthful appearance and diminishes the look of signs of aging, including fine lines. Remove built-up, dull layers of dead skin with a leave-on AHA or BHA exfoliant to reveal the supple, smooth skin hiding beneath. Our SKIN PERFECTING 2% BHA Liquid Exfoliant is an excellent option. Consider our CLEAR collection of products, designed to alleviate breakouts, clogged pores, and blackheads, regardless of your age. Keep our Moisture Renewal Oil Booster in your beauty cabinet. This hydration-enhancing blend of non-fragrant, antioxidant-enriched plant oils immediately boosts moisture in your skin. Apply it before your serum and your moisturizer, or mix with either one and then apply. Consider the anti-aging superstar retinol to improve the appearance of wrinkles, loss of firmness, and other significant signs of aging. Try our customer and staffer favorite, RESIST Intensive Wrinkle-Repair Retinol Serum. If you’re no stranger to retinol and want something more potent to amplify results you’ll see in the mirror, consider our CLINICAL 1% Retionl Treatment, which is packed with retinol plus other proven anti-aging ingredients ideal for skin enduring mid-life changes. For more information on how to incorporate Paula’s Choice Skincare products into your personal routine, you can schedule a free one-on-one consultation with one of our Client Services representatives here.